Lately, I have been CRAVING steel cut oatmeal in the mornings. Sometimes, while I am working out in the morning, it is thinking about steel cut oatmeal that gets me through my run...or bike...or swim. What are steel cut oats? Steel cut oats are whole grain groats (the inner portion of the oat kernel) that have been cut into two or three pieces by steel rather than rolled and steamed (common oatmeal). 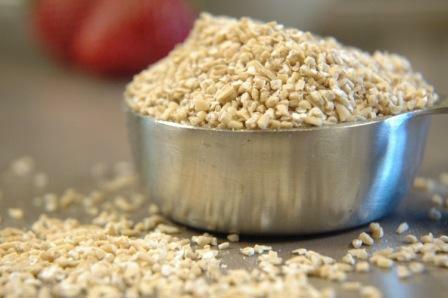 Steel cut oats are also known as pinhead oats, course cut oats, Irish oats. This form of oats takes longer to cook than rolled or instant oats due to its minimal processing. Steal cut oats tend to have a nuttier flavor and (my favorite characteristic) a chewy texture...even after cooking and reheating. I avoided making steel cut oats for a long time, basically because they take about 20-30 minutes to cook. A few months ago, I read a blog that suggested cooking steel cut oats ahead of time (like a week ahead of time) and reheat in the morning. Brilliant. So, began my love affair with steel cut oats. Typically, I make a batch of steel cut oats one-two times per week (depending on how many servings Matt steals). One serving = 1/4 cup dry oats so one batch tends to last about four mornings. Yes, the ingredient list is pretty simple. 1. In a medium sized pot, bring the water to a rolling boil. Add the steel cut oatmeal, bring back to a boil and then simmer on low, covered, for 25-30 minutes, stirring occasionally. 2. When the oats become creamy and tender, remove from heat. Let cool before transferring to airtight container. Place in fridge. 3. In the morning, add a splash of milk and reheat in the microwave for about one minute, stirring after 30 seconds (you could also reheat on the stove). I usually stir in chia seeds after 30 seconds of cooking the oats in the microwave. 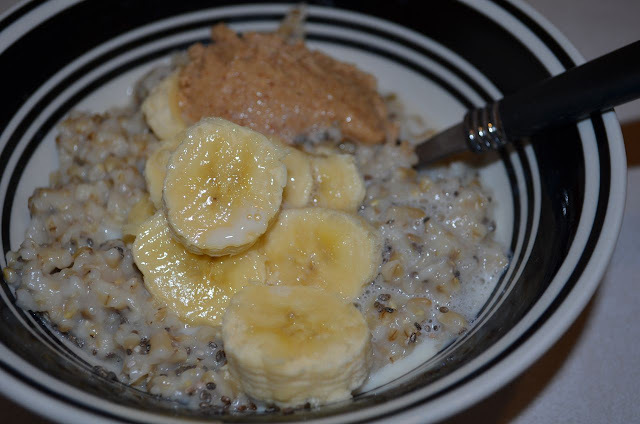 Then, I like to add one banana sliced, almond butter and milk after the oats have been completely reheated. Angela, at ohsheglows.com, stirs in her desired ingredients while making the initial pot of steel cut oats. I keep my oats pretty basic initially so I can start with a plain batch every morning. However, your options are endless. Be creative!